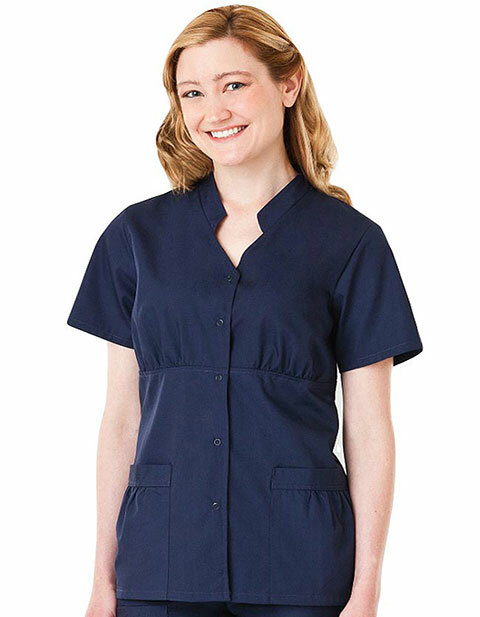 A stylish snap front scrub top for women from White Swan Fundamentals collection. Aside from the snap buttons at the front, the shirring at the bust and pockets of this shirred collar scrub top add to its sleek look. Two roomy front patch pockets are also made available to ensure your paraphernalia are safely stored. The textile used for making this 26-inch long scrub top is soil-release poly/cotton fabric, which makes it easy to care for.